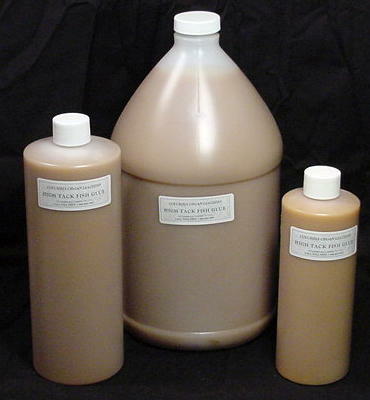 This glue is used just like flake hide glue with the exception of having to mix and heat it. No more messy glue pots and ruined glue. Our high tack fish glue tacks leather to wood in about a minute and it dries quickly. It cleans up with water and is easily removed with a warm damp cloth after drying. This is an easy to use glue for applying pouch leather without making a mess for the next time releathering is required. A Free Sample is available with any order! Our Felt & Leather Glue is a PVC based glue which is water soluble before it dries and forms a flexible, water proof adhesive when it has cured. 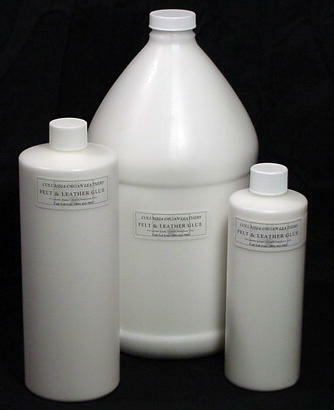 It is excellent for gluing felt & leather and for other applications where a flexible bond is desired. We do not recommend it for gluing leather to wood because it is very difficult to remove the next time the leather must be replaced. A Free Sample of this glue is available with any order! This glue should not be allowed to freeze and therefore cannot be shipped when temperatures are expected to remain below 30 degrees Fahrenheit. Originally developed for the gluing of leather in shoe manufacturing, this wonderful contact cement is perfect for gluing smooth fiber disks to leather surfaces. Due to the high fat content of some leathers on the market today, gluing fiber disks and felt & leather valves to the grain side of leather can be a bit difficult. This glue does a great job when the RAM is used. ReActivation Method: Apply a small amount of cement to fiber disk and put it in place in the center of the pouch. Immediately remove the disk, leaving glue on both surfaces. Allow it to dry for about a minute. Apply a little more glue to the fiber and put it in place. When the glue cures, you will have a very strong bond! 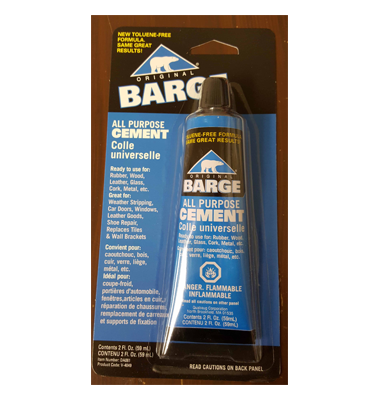 Barge Cement is available in 2oz tubes for $8.25 per tube.